It was one of those wonderful dinner parties with family and good friends, good wine, and good conversation. Mary is discovering her voice as a writer. Elly, my mother-in-law, is an accomplished novelist. She was in a mood to give advice. "Don’t read anyone with too strong a voice. If you read Faulkner, you’ll write like Faulkner. If you read Salinger, you’ll write like that." She doesn’t say reading is bad; she herself is alternating between Proust and Tolstoy while working on her novel. "Virginia Woolf is OK. So is Austin. You have to read, but you need to be careful." One must permit influence, however; we don’t create in a vaccuum. I read a passage out loud to the table from one of my big photographic gurus, Frederick Sommer. Much of his philosophy about the creative life is about how what you bring to the table is nothing new. You can’t pay attention to what isn’t already contained within yourself, otherwise you wouldn’t recognize it. "Isn’t it spiritual though?" asked Janis. "Doesn’t something come from outside ourselves?" Well, duh! was my response. "Well, the source is outside the physical realm. We bring it to the material. If that isn’t a spiritual path, what is?" I told my story of being in Israel. When I was in Jerusalem, I felt deeply the potent energy of that city, and was having spiritual epiphanies right and left. I’m not Jewish, but I felt the deepest connection among Jews and at the Western Wall, and I visited there every day to pray, to meditate, to photograph. The spiritual was knocking loud at the artistic gates for me. Robin was keeping a careful eye on me for signs of psychosis (for something called Jerusalem Syndrome—it sounds like I had a mild case of it). My creative juices rose to the surface there because something in me needed that climate, and that spot, for it to be realized. There is, at the best of times, a sense that you’re tapping into all available experience in the universe in the act of creating, even if that experience appears to be outside of anything you’ve ever known before. But it’s already inside you, otherwise, how else would it seem so familiar? It is what I regard as the spiritual dimension to creativity. It’s all available, but you have to make choices to make it material in the right way. To not read Faulkner. To decide you’re not undergoing a religious conversion in Jerusalem, just tapping into real good juju. Artmaking is the act of applying form and structure to that cornucopia of available, unconscious experience that lies beyond our individuality. We’re all drinking from the same well. A liberal, Lutheran minister friend of ours asked Robin, "So, are you going to have an orange on your seder plate?" Our nephew Nick emailed us from San Francisco, about his seder. "Have you heard of the orange on the Passover plate? I guess the story goes: long ago a little girl asked a rabbi, ‘Rabbi, you are wonderful, what must I do to grow up and become a rabbi some day?’ He replied, ‘Silly girl, a woman rabbi is like an orange on the pesach plate. It will never happen.’"
"So of course we had an orange on the plate." The story is apocryphal. It’s really about lesbians. Here’s the deal. I’m in extreme judgement mode. Duality is the issue. The Shma, the most important Jewish Prayer translates into, in my idiosyncratic, derived-from-Maimonedes and Jewish Renewal translation: "Pay Attention: God is One, God is Everything, Everything is God, Everything is One." In some traditions we are directed to say it three times each day. Maimonedes says that if you work for several years on this prayer, you’ll be ready to go on to other prayers. In Islam, it’s: "There is no God but God." Mystic Muslim traditions, like Sufism translate that as, "Everything is God, etc." So how come so many people here, who are saying this prayer, in so many incarnations every day are so obsessed with the Other? Male/Female, Arab/Jew, every permutation of religious and regional parsing, ad infinitim. My favorite woo-woo healer, Isabelle Lambert, says that, "Jerusalem is the identity chakra for the world, and it’s broken." The hard work for me is to remember the Shma, in all its permutations, whenever I forget that there ain’t separation. I’m saying it about fifty times each day. I need to do it more. It’s fitting, on the eve of my 50th birthday that my life issue, non-acceptance, is so up. Last night, an Orthodox woman told me that she couldn’t lead prayer in front of men because it would be immodest. The rationalization: men are the only male creatures who are ugly. In humans, woman are the peacocks, so that men need to have their leadership positions, their access to the Torah. We went to a little tear-dropped shaped chapel on the Mount of Olives, the hill that encompasses thousands of Jewish graves, several churches, Mary’s tomb, and the Garden of Gethsemane. The chapel, about halfway down the Mount, is allegedly where Jesus looked down at Jerusalem, and cried with the awareness, in my interpretation, that Jerusalem would come to great harm if the people didn’t start noticing their non-duality. It’s still happening!! When we walked to the bottom past a convent, a few more churches, and another several thousand graves, we came to the Garden of Gethsamane where Jesus surrendered to God’s will about his impending crucifixion. That he cried in non-acceptance of the way things are, halfway down, and surrendered, by the bottom, was useful in my process. Doug once gave me a button reading: "God grant me the authority to change the things I cannot accept." That’s me. Surrender is my hardest spiritual issue. I don’t want to! I want everyone to stop hating each other and seeing each other as different and make nice with each other. I want people to stop hurting their kids. For all Orthodox Jewish and Muslim women to be able to speak their heart in front of any gender, without being "immodest." For people to see that it’s all "us". Especially for me to get it. Sigh! Everything is God. Later on the same night. I was out with my family, two colleagues (both Orthodox Jews) and their wives. They were great! The wives existed as full people in these marriages. There was humor and engagement all around. Then the whole restaurant sang Happy Birthday in five versions, in English, Hebrew, and Spanish by overlapping groups. It’s nice to know that there are unifying rituals. It was a "fix" for much of the day before. Sunday night at dinner, with colleagues from Robin’s workshop, I gleaned a little more insight into the kippah code. A black yalmulke means ultra-religious. A knit yalmulke, on the other hand, can mean secular. It turns out that is the kind I ended up buying the other day. Identity. Everyone wears one here. Boys with long payas curls. Ultra orthodox with fox fur hats on Shabbat. Arabs in black and white keffiyah. Franciscian monks in brown robes. Orthodox priests in black ones. A woman in an all white dress with a flared base and a turban looked like she was a Sufi, but she was a religious Jew from Brooklyn, in white for Shabbat. I have been in a fluid state about my own identity here in a big way. I can’t escape or deny the tradition I was born and raised in, but I have no Christian practice now in my life. I’m generally allergic to ritual of any kind with religious overtones. I prefer a private, non-demonstrative communion with God, preferably in the outdoors. But a few days ago I said the Shma at the Western Wall, again and again, until I felt a sense deep of connectness with the place. I put my palms on the wall and closed my eyes. I took within myself a core of calmness that lingered for days. From that point on, I had no trouble negotiating the crowded souks, and I even enjoyed the flow of energy passing all around me as I walked the streets. Robin is watching me closely for signs of Jerusalem Syndrome. She thinks I’m thinking of converting, which is putting it way too strongly. I suspect I’ll still be allergic to too much ritual when I get home. Jews have a lot of ritual. Their services go on way too long. But I’m getting a contact high from all the religion in the air, and allowing myself to accept it as something I need in my life. But, as expressed in Jerusalem, it makes for a tense city that feels as though the place is on the verge of being upended at any moment. Everyone wears their identity in clear, unequivocal ways, as much to say who they aren’t as to say who they are. The taxi driver, a Druze man named Nour, careened up the one lane path, honking all the way to scatter the pilgrims descending on foot. We even made one man flattened himself against the stone wall. It was the best entertainment I’d had in a week. Robin was in another town, teaching a workshop to 50 Israeli therapists. I was with Elly and Felicity on the way from the Western Wall to the Mount of Olives. We stopped at the viewpoint overlooking the Jewish Cemetery, which stretched down the valley. On the other side rose the Temple Mount and the Old City. 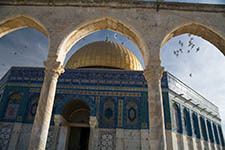 This is the vantage point from which the iconic photographs of the Jerusalem skyline, with the gold Rock of the Dome in the foreground, are made. We stopped at the Sanctuary of Gethsemane. The Christian sites in Jerusalem have generally left me cold, but not this one. In a courtyard grew olive trees several millennia old with broad, gnarled bases. The chapel, even though it is modern (1924), felt imbued with the spirit of the ages. Outside, on a rock under a carving of Jesus praying, two women knelt in prayer. Inside the church a group was seated around the alter and praying the Lord’s Prayer in a common mumble (so unlike the discordant cacophony of a group of Jews praying, where each person proceeds at their own pace). Then the women started singing, and the sanctuary filled with their united voices. I have generally squirmed in the presence of public piety, particularly the Christian flavor. There’s my history to consider, but lately I think it is because I associate public displays of Christian fervor with politics that I find abhorrent. I’ve been in a lot more synagogues than churches in the last 14 years, but I still feel like an outsider to Judiasm. I didn’t grow up in the tradition, and I know only a few of the prayers. But I feel comfortable around it. Here in Gethsemane, I also felt like I was an outsider, watching this Christian expression of deep spiritual devotion. I was able to accept it for the genuine, meaningful connection with the Divine that it obviously was. Because I could hold my reaction at a distance, I could allow myself to feel deeply moved by the display. It healed something in me. A guest entry from Robin. If an Israeli says, "Don’t worry, it will be alright," run for your life! After several days of experiencing this disjoint between assurance and reality, I think that it’s an expression of their faith in God, and has no connection with the problem at hand. Sometimes it’s assurance that you’re not being ripped off, when in fact you are. Honesty, among many of these folks is a different concept than in the U.S. At home, I expect some politicians and most corporate p.r. people to lie to me. Otherwise, we live in a culture that expects honesty. Here, the taxi drivers, many merchants, especially those who deal with tourists, and many business people lie as a way of life. I’m working on theories of "the other" and what a society with so many "others" does with that plurality. If you’re "not us", ethnically, nationally, religiously, or politically, there is no contract to treat the other well. Driving in Jerusalem is cross between "chicken" and forebearance. At intersections and anywhere traffic merges, the merging car heads into thick traffic and other cars let them in. In the left lane on the freeway, a car will speed up to just behind the one in front of him and the front car will merge to the right. As a pedestrian, you walk into traffic and drivers first speed up (to make sure that you’re serious) and then stop. After I had figured this out, Doug scared me into hyperventilation by screaming "Stop!" when I had just waded into traffic, and the driver sped up. The social contract works when everyone is equally aggressive and equally polite. Yesterday’s newspaper reported that six times more Israelis die in car accidents than in terrorist attacks, so I’m not sure what percentage of the time the social contract works. Today we rented a car and Doug was quite proud of successfully nosing across and into traffic in situations that would never occur in Seattle. Tonight the cabdriver who had blithely ripped us off for about 5 shekels ($1), also backed down 15 yards on a main street to continue to back about 30 yards to get to our hotel. He cheerfully explained that, "You get to do things like this when you drive a taxi." We spent two days walking the Old City. Four quarters: Christian, Armenian, Jewish, Arab. 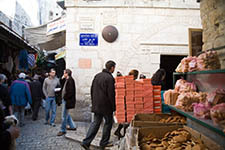 Many of the Arabs are Christian, many shops and people are not in their "appropriate" corners. It’s a warren of twisting alleys, hole-in-the wall shops, many residences, churches, synagogues, mosques, the Western (Wailing) Wall, the Stations of the Cross, a new way into the Dome of the Rock, beggers, black-clad Hasids, priests, nuns, and ministers, dark-eyed kids, aggressive merchants, scruffy cats, religious paraphenalia of the three monotheist religions on one shelf, kosher and halal cafes, and layers upon layers of history. The best moment: at 11:45, sitting on the 3rd floor roof of a café with Doug and my neice, Felicity: muzzeins from 3 different mosques began to chant the call to prayer. One voice was very high, and piercing. It penetrated to the heart and bones of all of us. Moments after the chanting stopped, the noon church bells began. The Church of the Redeemer, across the street, had two huge deep-voiced resonate bells. Up the hill were smaller churches with single clangers. We were transfixed. A few days before, I’d had my first experience with the Wall. I began with beginner’s mind—not much anticipation, just wonder. First I stood in meditation. On the men’s side, several shofars (rams’ horns) were being blown in longish blasts. Several different groups were holding morning prayer services. A Hasidic song, familiar to me, floated over from the men’s side. I sang along for a while, and then the waves of feeling hit. Joy, grief, awe, awareness, awareness, awareness, more feeling, more awareness. Of what? The layers of historical meaning for me as a Jew, the emotions of all around me, the longing, the connectedness and the separation of so many standing beside me and across the wall that separated me from the men, and my husband, the years of strife over this stretch of wall, the subdued singular prayer of the woman contrasting with the organized groups of men, the Dome of the Rock shining above our heads, sitting on its quiet plaza, the all-too-important identities of the people who surrounded me. I stood for awhile. When I had grounded myself, I did some of the usual morning prayers of gratitude, the Shma—Jewish Renewal-style (God is everything, everything is God), the end of the Kaddish, which is a prayer for peace, then a song I learned: "God bless the children of Ismail/God bless the children of Israel/God bless the peace of Jerusalem/Jerusalem will live in peace./(Shalom/Salaam) X3 /Jerusalem will live in peace." Then back to tears and grounded meditation. We walked the Stations of the Cross. Some have chapels surrounding them, some are plaques on ally walls in the Arab quarter. As we got to the last stations, we walked up a story to a roof of the Coptic monestary, where the Ethipiopians have their piece of the Stations. (The Ottoman empire divided the Church of the Holy Sepulchre into six unequal parts to settle the horrible squabbling amongst the Christian sects who claimed the land where Jesus was crucified and rose again.) That roof was the holiest feeling place on the entire walk. As Doug walked around snapping pictures in focused bliss, Felicity and I sat on some stairs and watched the Ethiopian monks and a nun smiling and laughing together as another sat reading under flapping laundry. It was peaceful. 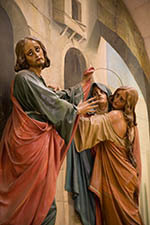 This Jew-Bu woman, ½ Jewish/ ½ Catholic / non-practising girl/ and recovering Methodist guy, all found the gentle communion of these gentle people the most moving place of all the stations. It was dynamic. The rest of the Sepulcher felt as dead as the Roman ruins at Caesarea—nice tile, but nobody’s home. Doug says I should tell you one of my responses: Inside the Sepulchre, right before the Roman Catholic part, we saw a large painting of Abraham preparing to sacrifice Isaac. A tour guide said that the sacrifice was a precursor to God sacrificing Jesus. Spontaneously, I put my hands on my hips, and said, "I don’t think so!" Layers and layers and layers. If I had been raised Christian, I might have had a different experience. But as I looked around the bizarrely fractionated church, I didn’t see many people (and most were Christian), having a religious experience. It was spectacle, not participation. I think nearly any church in the world does a better job of bringing people to a God experience than does witnessing a thousand-year-old divvied-up depiction of what happened. But that’s just my opinion. It does depict a powerful story. An organizing principle for an exploration is a useful foil. Meaning is beside the point. We weren't seeking a religious experience by following the Stations of the Cross, which would have been a bit hard to swallow for two Jewish women and one Jewish wannabe guy. It was just a means to plot a path across the Old City of Jerusalem, and pause to consider where we were. The route starts deep in the Moslem quarter by St. Stephen's Gate. 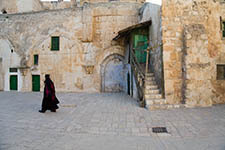 It winds uphill on Via Dolorosa, passing rug merchants and Christian kitsch stands, through the crowded Arab souk, and ends at the Church of the Holy Sepelchur. The first two stations, in a Franciscan monastery, are a peaceful retreat from the busy street. The next few are plaques on the street, or grotto-like chapels just off it. Inbetween are the inevitable come-ons from the rug merchants and souvenir shopkeepers. Now Robin is catholic only in her ability to talk with anyone, which means that even a rug merchant's come-on is an opportunity for a conversation and a connection. "No, ! 'm not buying one," she'll start, and 15 minutes later we've learned that the rug dealer is half-Armenian and half-Arab, that the store’s been in his family for generations, and he’s shown us the old pre-Roman cistern 20 feet deep in the back of the shop. Felicity's jet black hair and dark skin gets her mistaken for a local, and queries are sometimes made to her in Arabic. I am having experiences that are just not going to happen when I'm on my own, even if I am nearing an anxiety attack from the jostling, claustrophobic crowd in the souk. The ninth station is just outside the courtyard of the rooftop portion of the Church of the Holy Sepulchur controlled by the Ethiopians. In my time in Jerusalem, I have found myself even more sensitive than usual to the feeling and energy of place. Something here is powerful in that regard. Of all the sights in Jerusalem, this was the one place where I felt a broad aura of peacefulness and gentle love. The courtyard was spare, and a dome of the the church beneath us penetrated the bare expanse. Three Africans, in robes, were talking in a corner, in evident friendship and comradery. A man sat reading on the next terrace level up, his eyes shielded from the sun by the shadow of a line of laundry, which were probably religious vestments. Tour groups passed through, on the way to the next Station, but I didn't want to leave this wonderful place. Robin looked into my eyes and said, "You're really here." This is the best mental place to photograph from, and I slowly tipped the sensations in my mind and body into compositions. Arrangements of shape and form that seemed to match my inner state were what I was seeking. In a few weeks, when I see the film (yes, I’m shooting film), I'll see what sense of this place I captured. Within two hours I had encounters with the physical monuments of all three great monotheistic faiths. First, The Church of the Holy Sepulcher, the most revered site of all Christiandom. The place is really strange. It is dim and crypt-like. I was early enough to avoid the tour groups, and had the church almost to myself, except for the dark clothed men sitting in dim corners that were probably keeping a furtive eye on me. They appear to have been left there centuries earlier, and nobody bothered to tell them their shift was over. There’s a density of stuff in the place—icons, incense burners, crucifixes, paintings, and it’s all dim. I think the Dark Ages have not ended here yet. There isn’t the usual sense of uplife and awe of a great cathedral whatsoever in this place. It feels all withdrawn and remote, a space of deep interior sensation. On the way to the Temple Mount I climbed up the ramp past the worshipers at the Western Wall. This Jewish spiritual life is demonstratively alive and outgoing, the opposite of the recessive mode of my last stop. I paused to watch from the overhead vantage point. I stepped onto the Temple Mount. It was like crossing a threshold to another universe. The bustle of Jerusalem, and the fervent worship of the Western Wall was beyond and far away. This was a peaceful grove of trees, and a broad plaza of stone from the center of which rose the blue and gold Dome of the Rock Mosque. There were multiple tour groups, but enough room that I could listen in for a moment to glean some learning, and then retreat into my solitude. I did have to shoo away a persistant, small gray-haired man who wanted to be my guide, and who could not remember that I had declined his services three times in the previous hour. But besides that, I felt this to be a place of peace and repose. Young Moslem women in head scarves, always in groups of three, strolled the garden, and boys bounced soccer balls against the plaza walls. Here, finally, I felt I could photograph from a place of centered awareness, which I could not begin to do at the beginning of my tour. I left feeling fulfilled and content. Ezra, Robin’s first cousin, once removed, is living in Israel, and he gave us a tour of the old city today. He studies in a yeshiva and works on a farm. Five years ago he came to Israel, "So I could learn Hebrew and prove the rabbis were wrong about Torah. I found out that they were right." We were headed for the Western Wall, and I wanted an appropriate yarmulke. Head coverings here are loaded with code, of which I am ignorant. "Your white ball cap is appropriate. It doesn’t matter what you wear so long as your head is covered," he reassured me. At a display of headwear he pointed out, "The blue and white one means you’re Pro-State (meaning Pro-Israel). The others have no particular meaning other than that you’re a religious Jew." But I’m secular, I thought. Wait a minute, I’m not Jewish. I just go to synagogue and say the prayers every Friday. In the end, I couldn’t make a decision (which exactly matches my mixed-up spiritual identity), which made my REI white cap the most appropriate thing I could wear. Ezra accompanied me down the ramp to the men’s side. Hundreds of black-clad Orthodox were praying and davening. The murmur of their combined voices rose like a fog. Ezra kept wanting to explain, but I wanted to feel where I was. I stood, and the skin on my scalp and back felt electric. "Are you feeling anything?" he wanted to know. "Yes, but it goes away if I describe it." Then I felt sadness. A wave, an ocean of sadness, a monumental wall of it. I felt the passion of the prayful throng. But mostly I sensed a huge, timeless grief of something irreparably broken. "That’s amazing! It’s so true!" His explanations, which were detailed, all had to do with the loss of the Temple by the Jews. Even though this is obvious, it didn’t ring true in my gut. This loss has much more going for it than 3000 years of Jewish history. Why I know that I can’t say.